Chris Whittier, V97, uses his vast experience and knowledge in the fields of population medicine, veterinary medicine and One Health, to direct the MS in Conservation Medicine program (MCM). In addition to teaching courses, mentoring students, and directing the MCM program, Chris is actively involved in global research and conservation efforts. While studying abroad in Tanzania during his junior year of college, Dr. Whittier had his first exposure to wild mountain gorillas. Inspired by the efforts of conservationists in the field, he went on to veterinary school with a focus on international medicine. His interest in great apes continued, and he returned to Tanzania as a veterinary student to work with renown primatologist and conservationist, Jane Goodall. Dr. Whittier went on to earn his DVM and PhD in population medicine, with a focus on the diagnosis and epidemiology of infectious disease in wild gorillas. 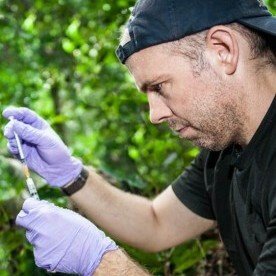 He has since put his expertise to work as a regional field veterinarian with the Mountain Gorilla Veterinary Project) in Africa, as a contributor to the USAID PREDICT Project, and as director of the MCM program at Cummings School. Whether he’s teaching courses, mentoring students, conducting research, or flying to the aid of mountain gorillas at a moment’s notice, Dr. Whittier’s work is marked by passion and enthusiasm. WANT TO LEARN MORE ABOUT THE IVM PROGRAM?